Yesterday, Nature – one of the worlds premier scientific journals recognized University of British Columbia scientist Rosie Redfield as one of the top 10 science newsmakers of 2011. …that month, Redfield took matters into her own hands: she began attempting to replicate the work in her lab at the University of British Columbia in Vancouver, and documenting her progress on her blog (http://rrresearch.fieldofscience.com). The result has been a fascinating story of open science unfolding over the year. Redfield’s blog has become a virtual lab meeting, in which scientists from around the world help to troubleshoot her attempts to grow and study the GFAJ-1 bacteria — the strain isolated by Felisa Wolfe-Simon, lead author of the Science paper and a microbiologist who worked in the lab of Ronald Oremland at the US Geological Survey in Menlo Park, California. While I’m excited about Redfields blog (more on that below) we should pause and note the above paragraph is a very, very sad reminder of the state of affairs in science. I find the term “open science” to be an oxymoron. The scientific process only works when it is, by definition, open. There is, quite arguably, no such thing as “closed science.” And yet it is a reflection of how 18th century the entire science apparatus remains that Redfields awesome experiment is just that – an experiment. We should celebrate her work, and ask ourselves, why is this not the norm? So I’m pretty sure I screwed something up. But what? I used the same DNA stock tube I’ve used many times before, and I definitely remember putting 3 µl of DNA into each assay tube. I made fresh sBHI + novobiocin plates using pre-made BHI agar,, and I definitely remember adding the hemin (4 ml), NAD (80 µl) and novobiocin (40 µl) to the melted agar before I poured the plates. UPDATE: My novobiocin plates had no NovR colonies because I had forgotten to add the required hemin supplement to the agar! How embarrassing – I haven’t made that mistake in years. Here is someone literally walking through their thought processes in a thorough, readable way. Can you imagine anything more helpful for a student or young scientist? And the posts! Wonderfully detailed walk throughs of what has been tried, progress made and set backs uncovered. And what about the candor! The admission of error and the attempts to figure out what went wrong. It’s the type of thinking I see from great hackers as well. It’s also the type of dialogue and discussion you won’t see in a formal academic paper but is exactly what I believe every field (from science, to non-profit, to business) needs more of. Reading it all, and I’m once again left wondering. Why is this the experiment? Why isn’t this the norm? Particularly at publicly funded universities? …The one thing that one could have reasonably predicted in 1991, however, was that scientific communication—and the publishing industry that supports the dissemination of scientific research—would radically change over the next couple decades. (Go read the whole article, it is great). Mathew Ingram also has a great piece on this published half a year later called So when does academic publishing get disrupted? Clarke has a great breakdown on all of this, but my own opinion is that scientific journals survive not because they are an efficient means of transmitting knowledge (they are not – Redfield’s blog shows there are much, much faster ways to spread knowledge). Rather journals survive in their current form because they are the only rating system scientists (and more importantly) universities have to deduce effectiveness, and thus who should get hired, fired, promoted and, most importantly, funded. Indeed, I suspect journals actually impede (and definitely slow) scientific progress. In order to get published scientists regularly hold back sharing and disclosing discoveries and, more often still, data, until they can shape it in such a way that a leading journal will accept it. Indeed, try to get any scientists to publish their data in machine readable formats – even after they have published with it -it’s almost impossible… (notice there are no data catalogs on any major scientific journals websites…) The dirty secret is that this is because they don’t want others using it in case it contains some juicy insight they have so far missed. This is unprecedented? This is the state of science today? In an era where we could share everything, we opt to share as little as possible. This is the destructive side of the scientific publishing process that is linked to performance. It is also the sad reason why it is a veteran, established researcher closer to the end of her career that is blogging this way and not a young, up and coming researcher trying to establish herself and get tenure. This type of blog is too risky to ones career. Today “open” science, is not a path forward. It actually hurts you in a system that prefers more inefficient methods at spreading insights, research and data, but is good at creating readily understood rankings. I’m thrilled that Rosie Redfield has been recognized by Nature (which clearly enjoys the swipe at Science – its competitor). I’m just sad that the today’s culture of science and universities means there aren’t more like her. Bonus material: If you want to read an opposite view, here is a seriously self-interested defensive of the scientific publishing industry that was totally stunning to read. It’s fascinating that this man and Michael Clarke share the same server. If you look in the comments of that post, there is a link to this excellent post by a researcher at a University in Cardiff that I think is a great counter point. This entry was posted in free culture, open data, technology and tagged blogging, data, open, opendata, science, UBC on December 22, 2011 by David Eaves. Pretty much everybody in government should read this fantastic New York Times article Sharing of Data Leads to Progress on Alzheimer’s. On one hand the article is a window into what has gone wrong with science – about how all to frequently a process that used to be competitive but open, and problem focused has become a competitive but closed and intellectual property driven (one need only look at scientific journals to see how slow and challenging the process has become). But strip away the talk about the challenges and opportunities for science. At its core, this is an article is about something more basic and universal. This is an article about open data. Viewed through this lens it is a powerful case study for all of us. It is a story of how one scientific community’s (re)discovery of open principles can yield powerful lessons and analogies for the private sector and, more importantly the public sector. Dr. Potter had recently left the National Institutes of Health and he had been thinking about how to speed the glacial progress of Alzheimer’s drug research. Our government’s are struggling too. They are caught with a 20th-century organizational, decision-making and accountability structures. More to the point, they move at a glacial speed. On the one hand we should be worried about a government that moves too quickly, but a government that is too slow to be responsive to crises or to address structural problems is one that will lose the confidence of the public. Moreover, like in healthcare, many of the simpler problems have been addressed. citizens are looking for solutions to more complex problems. As with the scientists and Alzheimer’s we may need new models to speed the process up for understanding and testing solutions for these issues. To overcome this 19th century approach – and achieve the success they currently enjoy – the scientists decided to do some radical. Consider this. Here a group of private sector companies recognize the intellectual property slows down innovation. The solution – dilute the intellectual property, focus on sharing data and knowledge, and understand that those who contribute most will be best positioned to capitalize on the gains at the end. Sadly this is the same problem faced within governments. Sometimes it has to do with actual intellectual property (something I’ve recently argued our governments should abandon). However, the real challenge isn’t about about formal rules, it is more subtle. In complex siloed organizations where knowledge is power the incentives to maximize influence are to not share knowledge and data. Better to use the information you have strategically, in a limited fashion, to maximize influence. The result, data is kept as a scarce, but strategic asset. This is a theme I tackled both in my chapter in Open Government and in blog posts like this one. In short, the real challenge is structural and cultural. Scientists had previously existed in a system where reputation (and career advancement) was built by hoarding data and publishing papers. While the individual incentives were okay, collectively this behavior was a disaster. The problem was not getting solved. Today, it would appear that publishing is still important, but there are reputational effects from being the person or group to share data. Open data is itself a currency. This is hardly surprising. If you are sharing data it means you are doing lots of work, which means you are likely knowledgeable. As a result, those with a great deal of experience are respected but there remains the opportunity for those with radical ideas and new perspectives to test hypothesis and gain credibility by using the open data. Wow, does that sound familiar. This is invariably the first question government officials ask when you begin talking about open data. The answer, both in the scientific community and for government, is that you either believe in the peer-review process and public debate, or you don’t. Yes, people might misrepresent the data, or publish something that is wrong, but the bigger and more vibrant the community, the more likely people will find and point out the errors quickly. This is what innovation looks like… people try out ideas, sometimes they are right, sometimes they are wrong. But the more data you make available to people the more ideas can be tested and so the faster the cycle of innovation can proceed. Whether it is behind the firewall or open to the public, open data is the core to accelerating the spread of ideas and the speed of innovation. These scientists are rediscovering that fact as our some governments. We’ve much to learn and do, but the case is becoming stronger and stronger that this is the right thing to do. This entry was posted in random and tagged collaboration, community, data, government, healthcare, intellectual property, new york times, open data, open government, public sector, science on August 18, 2010 by David Eaves. Stem Cell Charter Sign & Share Rally Begins! Why did I sign The Stem Cell Charter? Yes, I’ve been really impressed with the launch and the associated campaign. Yes, my parents are cancer researchers and I (literally) grew up in lab. Yes, the website and videos are beautifully done. Yes, the Charter is well crafted, balancing both the opportunities created, and the rigor demanded, by science with the ethics that should guide all human endeavors. And yes, I believe in both the potential of stem cell research to create new cures and medical treatments and improvements to the quality of our lives this will foster. But I signed the charter because at my core, I believe science to be one of the simplest, noblest, and purest pursuits available to humanity. It is the one endeavor in which, I believe, we come closest to understanding the unknowable truth about who we are, where we are, and how we got here. Stem cell research is an important part of that endeavor. The choice isn’t between banning it or not. The choice is do we conduct this research the way we should all science: openly, ethically, and in pursuit of the truth. This is what the Charter says to me. But then, that’s just my reason. I hope you’ll have your own. If you do, I also hope be part of The Stem Cell Charter Sign & Share Rally that is running from now until Saturday. So check out the site and sign the charter! (copied below). The Stem Cell Charter maintains that stem cell science has the potential to revolutionize the practice of medicine, develop treatments for diseases and create unprecedented hope for humanity. This entry was posted in cool links and tagged health, science, stem cell research on November 12, 2009 by David Eaves. 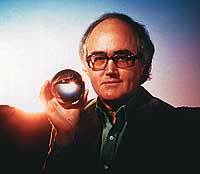 Last night I re-watched the first episode of James Burke’s 1985 history/science series, The Day the Universe Changed. If you’ve never had a had a chance to watch it, find it in your local library or watch it on Youtube (thank you Gary C for the link) you won’t regret it. James Burke is a personal hero of mine. I fell in love with his work in Grade 9 when I stumbled across his shows on The Learning Channel. I even emailed with him in my second year of undergrad in the hopes of securing a summer job (I wasn’t successful). There are so many things I learnt from Burke that have stayed with me over the past 2 decades but three things really stuck out as I re-watched the first episode. First, I’ve always admired his ability to take incredibly complex ideas and make them not only easy to understand, but fun and engaging. Part of it is his passion: Here is a man with a sharp mind, a glint in his eye, and a heart in love with his chosen subject. But watching the episode, it is obvious that the script is meticulously planned. So as Burke hops around the world, every word, every scene, every prop, helps advance the idea and narrative he is conveying. Had TED talks been available over the internet in 1985, I think James Burke would have been the master TED talk presenter (and more of a household name today). I spend a good part of my life trying to convey ideas, and it’s fun to go back and see a master at work. The biggest problem in predicting the future isn’t envisaging what technologies will emerge – it is forecasting how individuals and communities will respond to these technologies. In other words I often find people treat technology as a variable, but social values as a constant. Watching Burke yesterday, I realized that 20 years ago he shared this idea with me first. If I’m comfortable with the complexity of this type of thinking today, it’s because he’s given me two decades to first get comfortable, and then mature intellectually, with it. So if you are interested, go find a copy of The Day the Universe Changed. It is a wonderful defense of curiosity and asking questions, no matter what powers or issues that puts you at odds with. It’s that curiosity that Burke made me aware of in myself, and that today fuels and motivates me. This entry was posted in cool links, interesting people, reviews and tagged history, james burke, science, technology on September 9, 2009 by David Eaves.